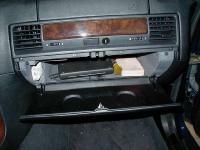 Tired of your glovebox door sagging down and leaving a gap at the top? Of course you are! Here's a quick and simple way to fix it. Open the glovebox. Along the top edge of the glovebox measure and mark spots 2 1/2" to the left and right of the latch. Using a drill bit that is slightly smaller than the treads of your screws, drill holes when you made the marks. Tighten a screw in both holes. 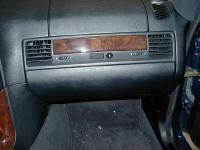 The screws will clamp the glovebox tighter against the vent panel behind it.